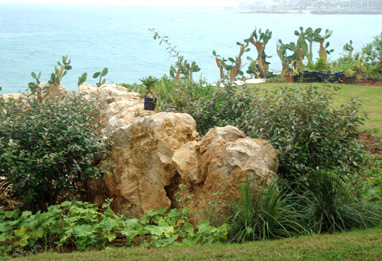 If we are installing your professional landscape design designed by us or by another landscape architect, at ROOTS, we begin to implement the design bringing into play our Landscape/ Irrigation Department, our Production Department and utilizing the carefully nurtured plants provided by our Garden Center and Maintenance Staff. We take the Design Teams Master Plan and detailed execution drawings and begin to construct the landscaping designs that were created. From our maps and drawings, we create accurate Bill of Quantities for all the required plants, which are then chosen from either ROOTS' own Garden Centers, the local market, or imported from Italy, Holland, Spain, Thailand or Egypt. ROOTS always creates irrigation plans to assure uniformity, frequency and quality of water suitable for each project. Site engineers, foremen, skilled labor and machine operators are drafted to install irrigation systems. Available for this level of the project are the current equipments such as truck-mounted cranes, telescopic cranes, front loaders, tractors, bobcats, JCB's, pickups and various sized trucks. For additional References, please click here.